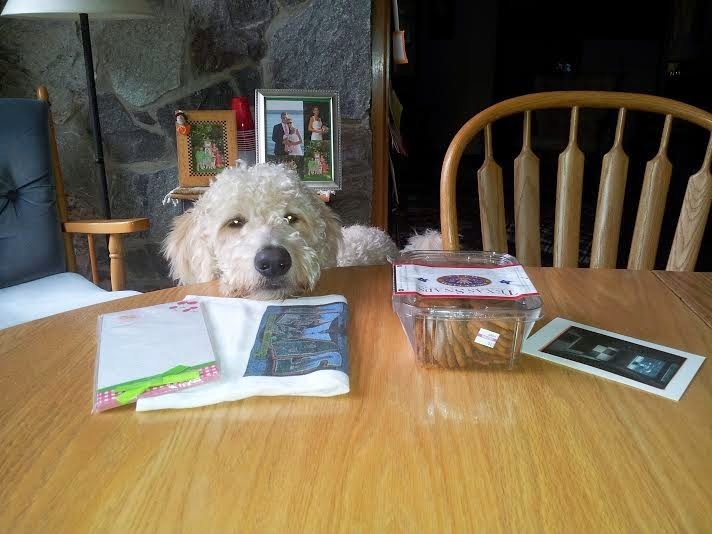 Goldilocks & Her Doodle: Fun Friday! Earlier this week, Jeff mentioned to me that he was going to one of our friends' houses this weekend for a little get-together. He then followed up his statement with, "Weren't you on that email?" Why no, I wasn't! Since I have been gone for two months, I think people have begun to automatically count me out on things... No biggie. Thankfully, a girl can always count on her friends, and I got me some good ones! The other morning when I checked the mail, there was a delightful package addressed to me neatly tucked away in our mailbox. Of course, I thought the gift was from my dear Jeffery but no. The girls in your life, in this case, Jenny and Tina, are the ones you can truly count on to be thoughtful. 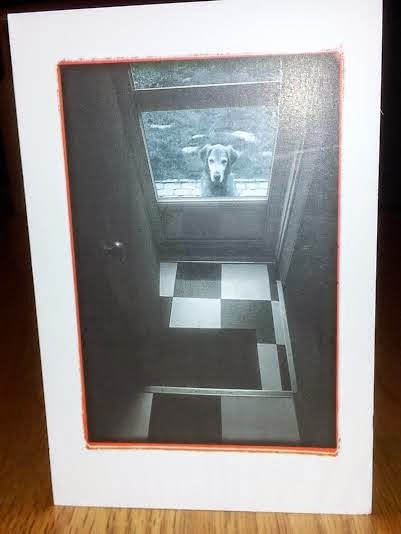 The card asks: "Are you ever coming back?" 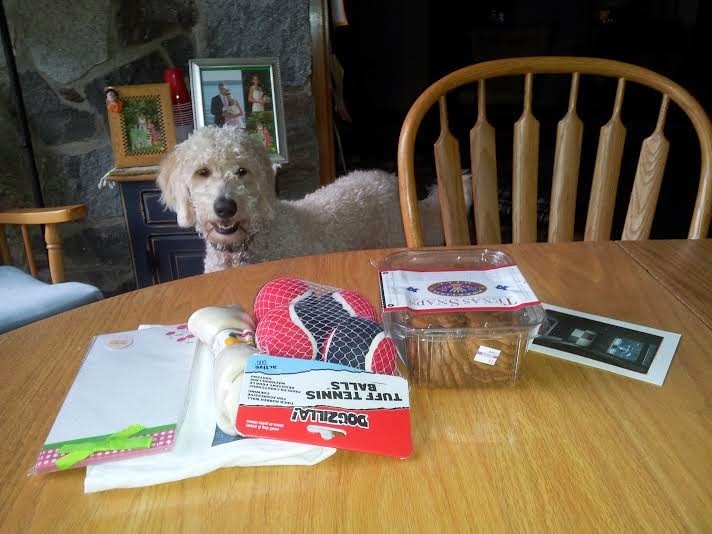 Lots of goodies for both the Milt and me -- I love the Texas tea towel and, of course, Texas-shaped ginger snaps! 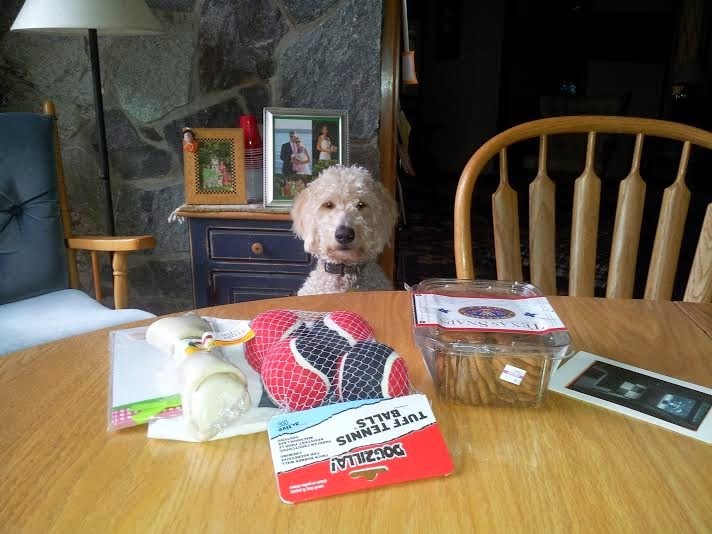 Milt noticed the gifts, particularly the rawhide bone and balls. He sat pretty to receive a gift. 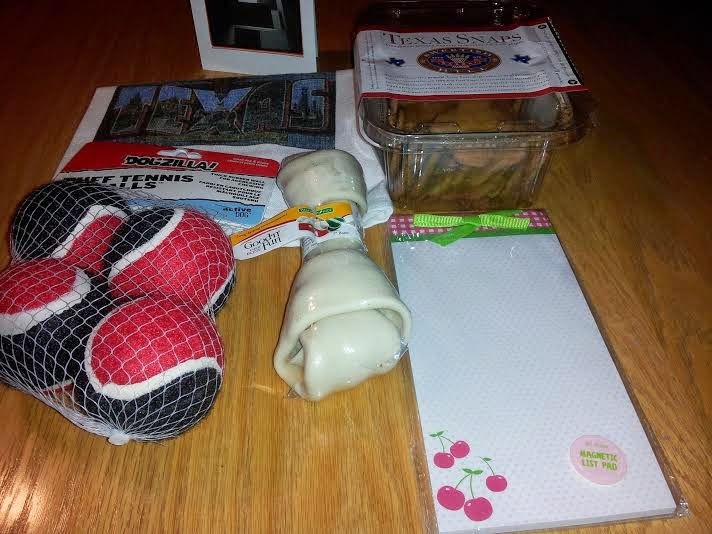 Then I decided to relocate his gifts because there was too much heavy sniffing going on...! I am not much for phone calls (I actually hate them. ), so this is more of a public thank you to my fantastic friends, Jenny and Tina -- You girls are the absolute best! I truly mean that -- thank you. Happy Anniversary, you two. Milton and I are glad you two got together.